I discovered this Sankey diagram in an article by Gutiérrez-Martín, C.; Borrego-Marín, M.M. ; Berbel, J. on ‘The Economic Analysis of Water Use in the Water Framework Directive Based on the System of Environmental-Economic Accounting for Water: A Case Study of the Guadalquivir River Basin” (published in Water 2017, 9, 180, open access article licensed under Creative Commons (CC BY 4.0). The Guadalquivir river basin is in Andalusia, Southern Spain. We see water taken (“abstracted”) from surface or groundwater by water supply companies and other users, distribution and water consumption by sectors, water flows ‘lost’ to the atmosphere and return of water to the environment. Flows in this diagram are in hm³ (cubic hectometres). Note that they decided to use another scale for water used for energy generation (x 10 hm³) since otherwise the yellow-beige would be 10 times wider and maybe spoil the whole diagram. The diagram has a top-down orientation and numerous loops and flow feedbacks, in contrast to the typical distribution diagrams (aka alluvial diagrams). It is well structured, nicely crafted and pleasing to the eye. Definitely on my top 10 list for 2018. 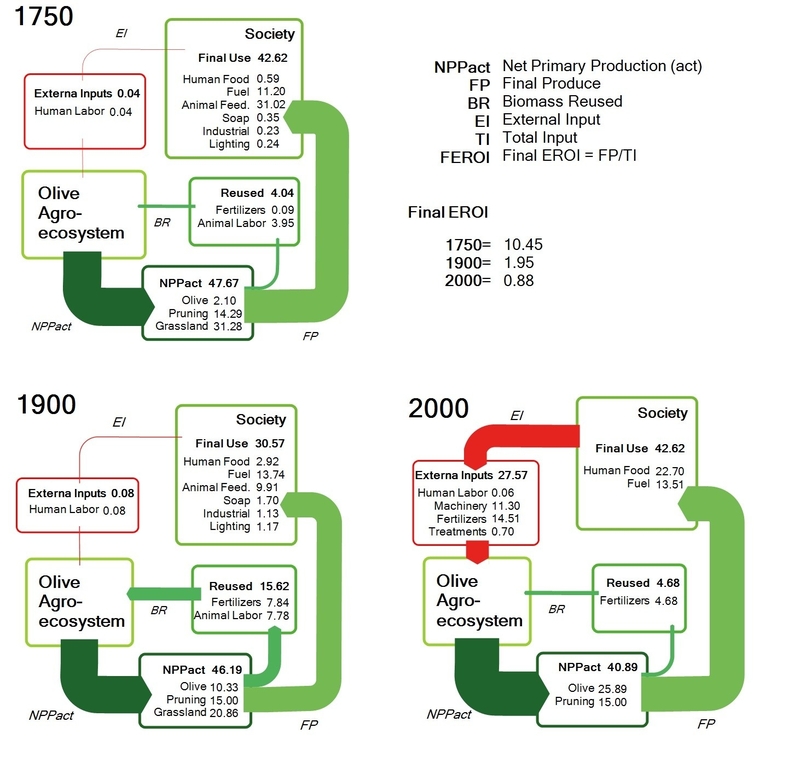 The Niche Canada blog ran an interesting piece by Juan Infante-Amate from Unversity Pablo de Olavide in Spain titled ‘The largest tree crop concentration in Europe: The making of olive landscapes in Southern Spain’. It is a summary of research done on the changes in olive cultivation in Andalusia from traditional olive growing in the 18th century to today’s industrialized production. Interesting approach and use of Sankey diagrams to compare a sustainability indicator. References to the full research papers can be found at the end of Infante-Amate’s Niche Canada post. Removal of salt from seawater (desalination) is used to produce drinking water and water for irrigation in the Canary Islands, Spain. This is an energy intensive process. The article ‘La importancia de los sistemas de recuperación de energía en la desalación de aguas en Canarias’ (The importance of energy recovery systems in water desalination in Canary Islands) by Baltasar Peñate Suarez and Sigrid Arenas (both of Departamento de Agua del Instituto Tecnológico de Canarias, ITC) on the IAGUA blog (in Spanish) describes how existing reverse osmosis (RO) salt removal systems with Francis turbines were retrofitted to be more energy efficient. The two Sankey diagrams in the blog post visualize the energy flows before and after the retrofit. Energy consumption per cubic metre of water desalinated could be reduced from 3.65 kWh/m³ to 3.05 kWh/m³ by installing isobaric energy recovery devices and last generation membranes. Check out the blog post to see both Sankey diagrams. The Spanish island of Minorca (Spanish: Menorca) is part of the Balearic islands archipelago in the Mediterranean Sea. Less crowded than Mallorca, and more tranquil than party location Ibiza, this island is popular for family holidays. 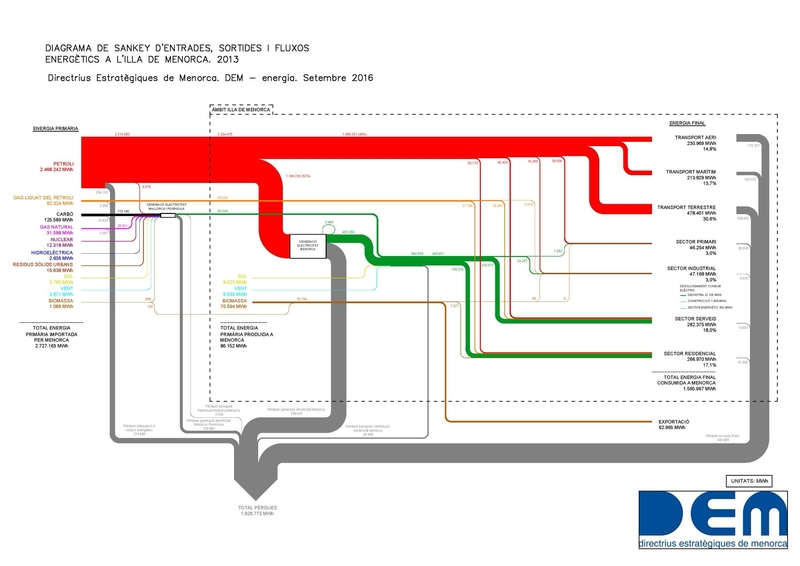 The Strategic Directorate of Menorca (Directrius Estratègiques de Menorca, DEM) has recently published this Sankey diagram depicting the energy flows of the island in 2013. Flows are in MWh. Primary energy input was 2.72 mio MWh in 2013, of which 1.56 mio MWh were used, while 1.92 mio MWh were losses. (difference was exported). Labels are in Catalan. The energy visual is different from others that I have shown on this blog before: The island is almost entirely depending on petroleum as energy source. Maritime and air transport consumes a large part, as does the services sector (hotels). Industry sector is a rather small consumer. 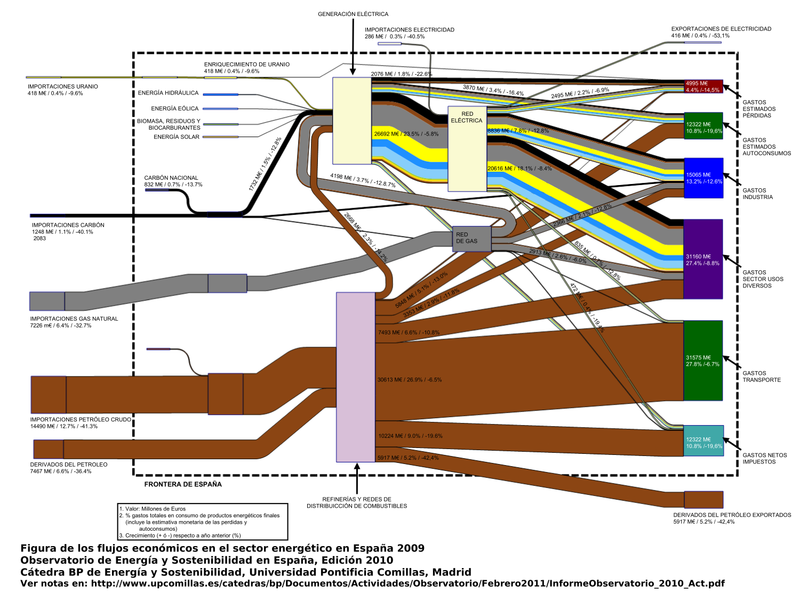 You can find a report in Spanish with a similar Sankey diagram here. This Sankey diagram for the water system of Segura river in Spain shows “the interchanged fluxes between the hydrological and the economical system”. 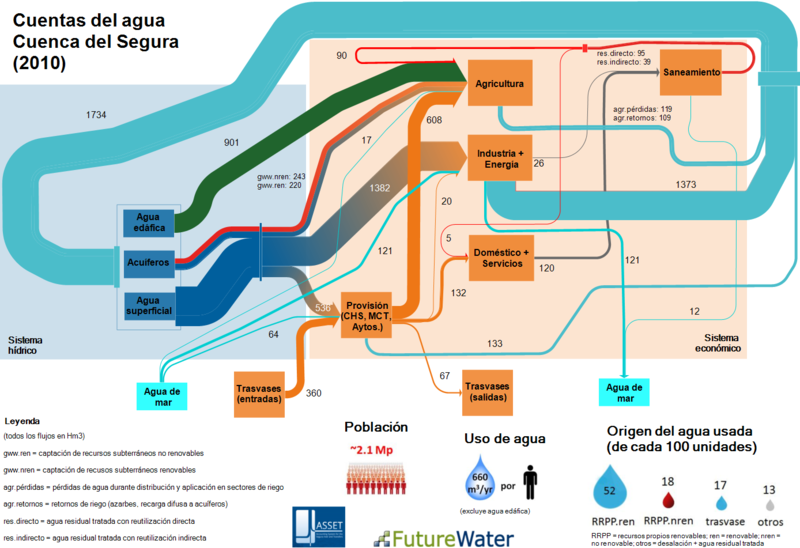 This is an output from the EU-funded ASSET (Accounting System for the SEgura river and Transfers) research project and can be found on the FutureWater website. Authored by Sergio Contreras and Johannes Hunink of Future Water (Contreras, S., J.E. Hunink. 2015. Water accounting at the basin scale: water use and supply (2000-2010) in the Segura River Basin using the SEEA framework. FutureWater Report 138). Flows are for 2010 and measured in cubic hectometres (hm³, 1 hm³ = 1000000 m3 = 1 GL). The left part with the light blue backdrop is the actual hydric sector, while the right side with the light orange backdrop encompasses the technical/economic sector. Water is extracted from surface waters (agua de superficie), ground water (acuiferos), and – interesting pespective – from soil water (água edáfica). Water from soil (green arrow, 901 hm³) is directly taken up by plants, so consumption is in the agricultural sector only. Agriculture is the largest consuming sector, followed by industry and energy generation, and water provision to households. Much of the releases of water from industry and energy generation is returned to the water system (1734 hm³). Additional tidbits of information below the Sankey diagram almost turn this into an infographic. This is a simple breakdown of energy consumption in a company. Electricity in green, fuel in grey. Only percentages are shown, no absolute figures. 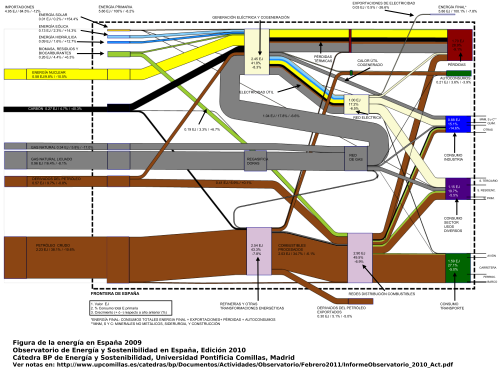 I am aware that I was kind of ‘Sankey diagram bashing’ with my post on Spain energy flow diagram last December. Now here is another one from the Iberian penninsula that fully makes up for the first one. It is by Observatorio sobre Energía y Desarrollo Sostenible (Observatory of Energy and Sustainability in Spain) at the Universidad Pontifícia Comillas in Madrid. I find it noteworthy that the observatory is part of a BP financed chair at the Escuela Técnica Superior de Ingeniería (ICAI). The annual report 2010 includes three Sankey diagrams, two of which are shown below. The first Sankey diagram (p. 16 of the report) has the typical pattern of a ‘national energy consumption, conversion and use’ diagram, similar to the ones presented here on the blog several times already for other countries. The flows from the left show energy sources, the nodes on the right are the use sectors. A nice feature here is that the node heights are adapted to the magnitude of the Sankey arrow, so that the largest energy consumption can immediately be seen. Flows are in in Exajoule (1 EJ = 1000 Petajoule = 10E18 J). 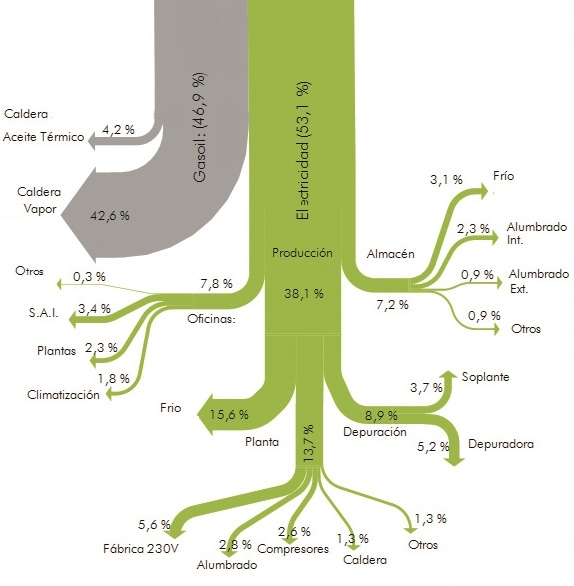 The total primary energy consumption in Spain in 2009 was 5.86 EJ (4.95 EJ of which are from imported fuels). Also shown next to the absolute quantities is the relative share of each flow in percent, and the change in comparison to the previous year. The second Sankey diagram (p.22) is what I would call a value stream Sankey diagram. This is interesting as the market price for the fuels, as well as for converted energy is used as a weighting factor, so that each Sankey arrow shows the value of the energy flow in millions of Euro. At some nodes you can see that a smaller arrow enters, and a wider arrow leaves: These are the conversion processes where value is added (or energy gets more expensive). This is a compelling concept for a Sankey diagram (another similar example is here), one that somehow could make Sankey diagrams more interesting for economists or controllers, rather than considering them exclusively in the engineering domain. The third diagram (not shown here, p. 19 in the report) shows the embodied carbon or the greenhouse gas emissions related to the different fuels, broken down by fuel and sector of energy consumption. The embodied carbon in the energy carriers were roughly 285 Mtons in 2009. The Sankey arrows for renewable energy sources as well as for Uranium are not present in the third diagram. 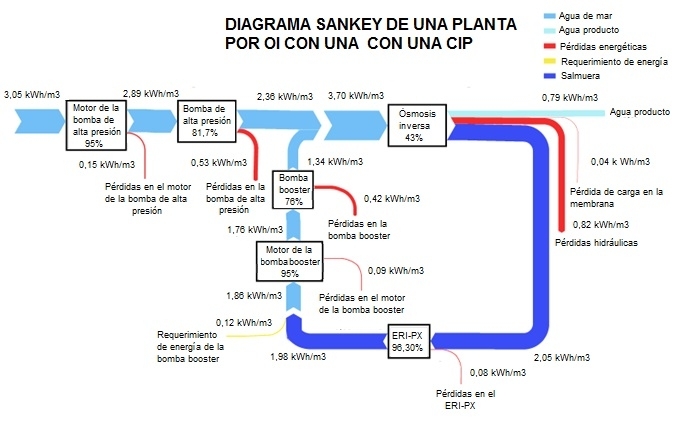 Me gustan mucho estas tres diagramas de Sankey! Merecen elogío.